This NCAER report presents findings of a survey carried out in 2015 across 30 states and Union Territories (UTs) in both rural and urban areas to evaluate the effectiveness of IRDAI’s nation-wide awareness campaigns and a special initiative in Tripura. The study compares current findings on insurance awareness of insured and uninsured households for life, health and general insurance with a post launch survey in 2010. 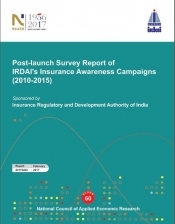 The 2015 survey also measures household awareness of IRDAI advertisements relating to spurious calls, rights and duties of the insured, and grievance and dispute resolution mechanisms.